The Cabernet Suite is a romantic suite that offers a private entry, queen-sized bed, and lovely bath with jetted soaking tub and shower. This room also features an inviting sitting room area with a flat screen TV. A second area has a twin sized daybed that can accomodate a third person at an additional rate of $50 per night. Friday and Saturday require a two night minimum. 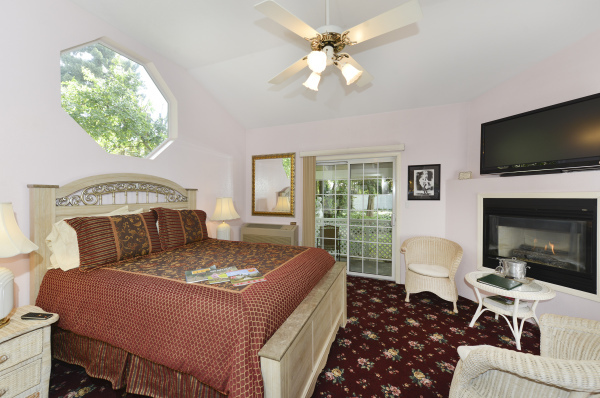 This inviting corner guest Suite features a vaulted ceiling and offers a queen-sized bed, flat screen TV, a large jetted soaking tub and private bath with shower. Enjoy views of the grounds from your private patio. Friday and Saturday nights require a two night minimum. 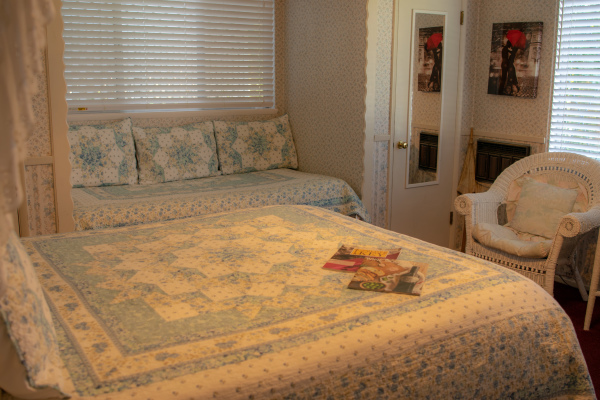 The Blue Rose Room boasts a refreshing décor with its queen-sized bed, electric fireplace and Flat Screen Smart TV. The large private bath features a large shower and double sinks. There is a twin sized daybed that can accomodate a third person at an additional rate of $50 per night. 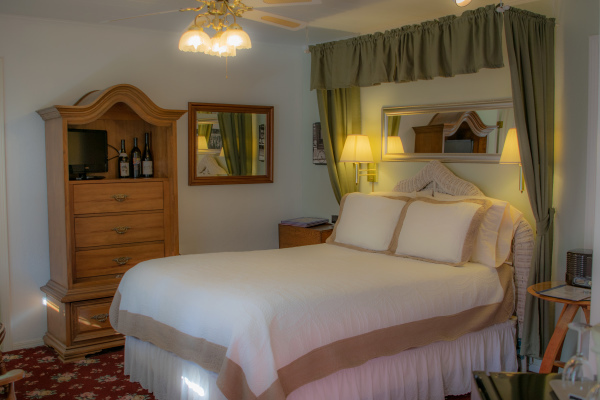 This room overlooks the front gardens, and is a perfect retreat for a romantic Napa Valley getaway! 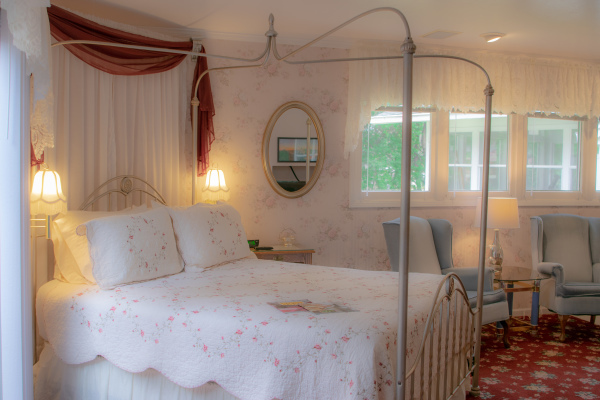 With its private entry this charming room is ideal for a relaxing getaway. 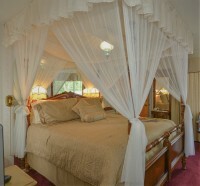 The Garden View Room features a queen-sized bed, electric fireplace, flat screen SmartTV and private bath with shower. Relax on the back deck with a hot cup of coffee while planning your day in Napa Valley's wine country. 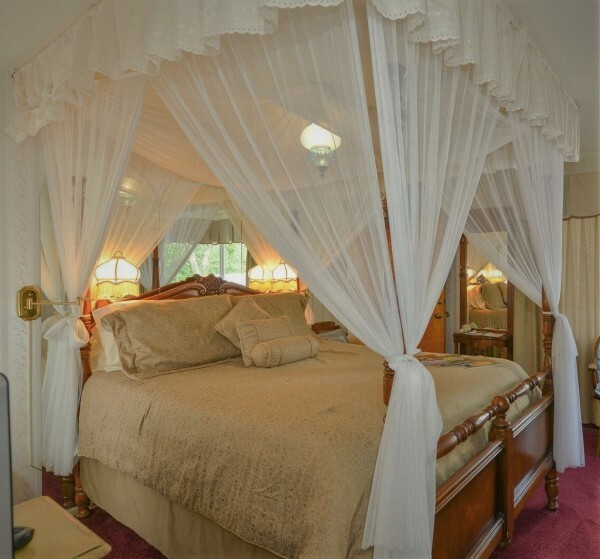 With it's elegant décor and a queen-sized four-poster bed, this room is so comfortable you might want to stay at our place forever! This room offers a sitting area with views of the century old oak tree in the back garden. Room features a flat screen SmartTV, electric fireplace and private bathroom with shower. From the living room step out onto the back porch via French doors and relax with a cup of tea and a great book.